Armodafinil is used to treat excessive sleepiness caused by narcolepsy (a condition that causes excessive daytime sleepiness) or shift work sleep disorder (sleepiness during scheduled waking hours and difficulty falling asleep or staying asleep during scheduled sleeping hours in people who work at night or on rotating shifts). Armodafinil is also used along with breathing devices or other treatments to prevent excessive sleepiness caused by obstructive sleep apnea/hypopnea syndrome (OSAHS; a sleep disorder in which the patient briefly stops breathing or breathes shallowly many times during sleep and therefore does not get enough restful sleep). 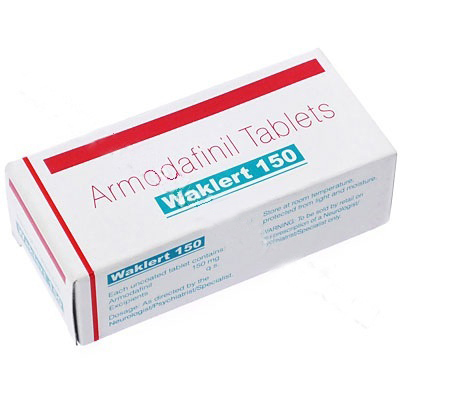 Armodafinil is in a class of medications called wakefulness-promoting agents. It works by changing the amounts of certain natural substances in the area of the brain that controls sleep and wakefulness. Armodafinil comes as a tablet to take by mouth. It is usually taken once a day. If you are taking armodafinil to treat narcolepsy or OSAHS, you will probably take it in the morning. If you are taking armodafinil to treat shift work sleep disorder, you will probably take it 1 hour before the start of your shift. Take armodafinil at around the same time every day. Do not change the time of day that you take armodafinil without talking to your doctor. Talk to your doctor if your work shift does not begin at the same time every day. Follow the directions on your prescription label carefully, and ask our doctor or pharmacist to explain any part you do not understand. Take armodafinil exactly as directed. Keep this medication in the container it came in, tightly closed, and out of reach of children. Store it at room temperature and away from excess heat and moisture (not in the bathroom). Throw away any medication that is outdated or no longer needed. Talk to your pharmacist about the proper disposal of your medication. Store armodafinil in a safe place so that no one else can take it accidentally or on purpose. Keep track of how many tablets are left so you will know if any are missing.